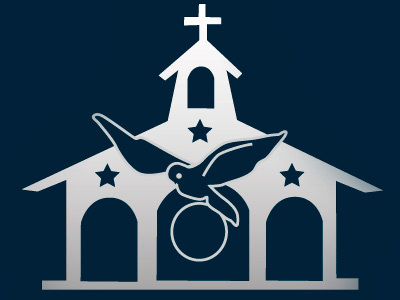 On Wednesday we had Mass at 8:00 am. The church was packed. There were 400 school children, all of the students from the Academy, the members of the Home, and some moms of the children. Father preached very well. He asked the children questions, and they participated very much and answered everything correctly. In the Mass, although there were so many of us, there was an atmosphere of silence, and you could experience the presence of Our Lady. When Mass was finished, some of the teachers told us that they had loved it. 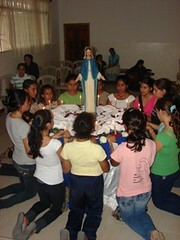 After Mass, we had a raffle, and the benefits went for girls who want to attend the WYD in 2011. After the raffle we organized movie for the children from Kindergarten - 3rd graders and an obstacle course game for the 4th - 7th graders. The boys from 8th-12th grade and those from the Academy had a soccer championship, and the girls had a cake baking contest. They had a wonderful time. The cakes were great, and the girls also had to make a sign with a spiritual application of the cake. We finished by praying the rosary sitting on the patio in front of the image of Our Lady. Each course went in front of the image and lead a mystery. It was very nice. That afternoon, the group "The Anawim" (the poor of Yahweh) began with great solemnity. Just as a remnant of Israelites remained faithful to the covenant with the Lord, we look for young people who want to remain faithful to the Lord, striving to keep in a special way the virtue of chastity. This idea came about because everyday the atmosphere of impurity gets stronger, and more and more children are affected at an earlier age. 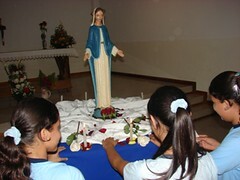 The young people who belong to this group will consecrate themselves to Our Lady every morning and live certain commitments that will help them to maintain the virtue of chastity. On the 8th of September, at 3:30pm, 14 girls began the group, and 5 boys began at 4:00 pm. 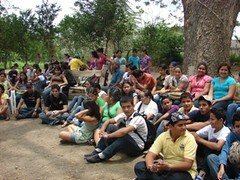 They are very excited, and some of them later entered the HMY. 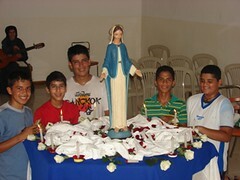 We prepared a table in the chapel with the image of Our Lady in the center. Each participant had a white candle and a white rose in their right hand and a white and blue bracelet. With the candle in their hand they read a prayer that was composed by Fr. Rafael. The truth is that it was wonderful; it gave you goose bumps. At 5:00 pm the members of the Home arrived to renew their commitments. We had a few moments of prayer before the Blessed Sacrament to remind us for whom we do everything. First, the HMY renewed thier commitments, and then the members of the LHM. You could truly experience the presence of Our Lady.